Keto Chicken Soup - Suuuper Creamy, Soothing + Delicious! Seriously guys, this keto chicken soup is my family’s favorite cold weather meal! 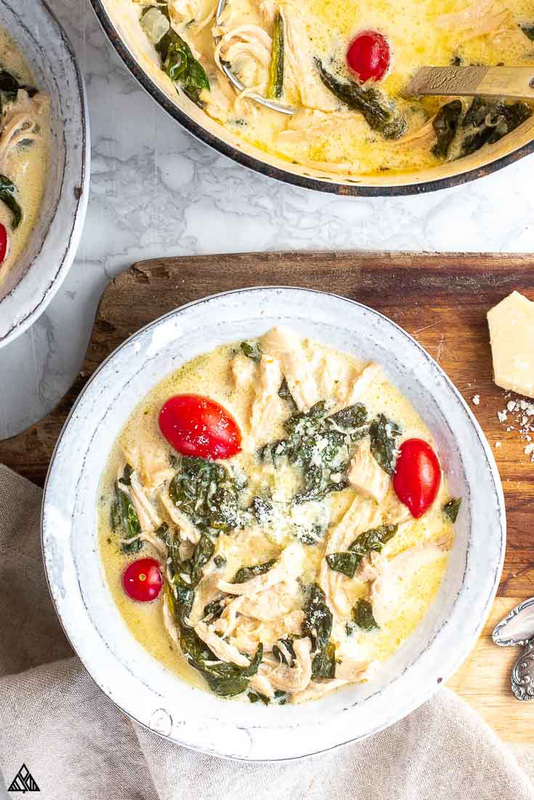 The ridiculously creamy broth, tasty keto vegetables, and protein packed chicken make for a balanced, soothing, and exceptionally delicious soup you won’t be able to get enough of! In fact, my taste testers love it so much they prefer eating keto chicken soup without low carb sides or toppings — making it the easiest of low carb meals to throw together! So, prep your stove and let’s get simmering! Whether you LOVE soup, or can live without it, you’ll dig this keto chicken soup recipe! I’m not kidding when I say, I’d eat this for every meal if I could! The thick bottom takes longer to heat — helping to saute veggies and simmer the soup without burning them. If you don’t have a cast iron, a thick core pot will do. 2. First we’re going to saute the onions in oil. This will take about 10 minutes, but make such a difference in your keto chicken soup! Sauteing aromatic low carb vegetables (such as onions and garlic) helps to better integrate the flavors with the rest of our soup, creating a smoother and more balance keto chicken soup. Add garlic to the pot once the onions are translucent, as it burns easily. 30 seconds – 1 minutes is all you need — You’ll know it’s done when the garlic becomes fragrant. 3. 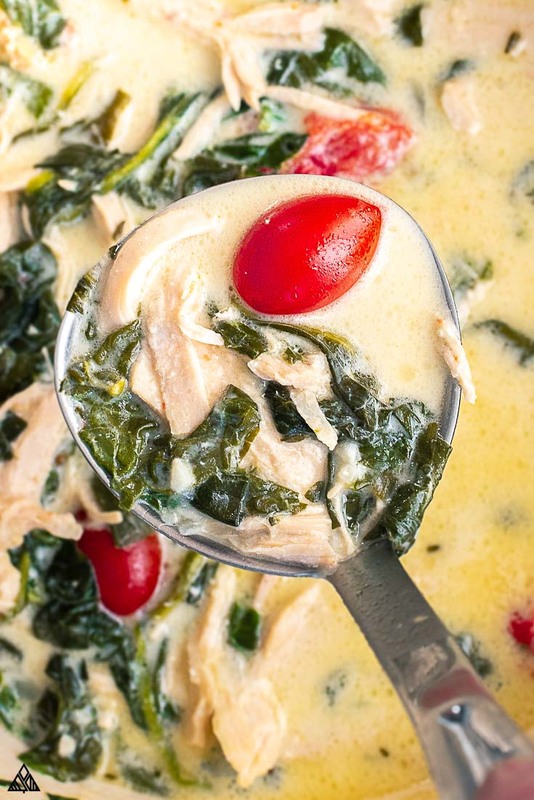 Add all other keto chicken soup ingredients (except spinach and tomatoes). Combine everything and let them simmer! Not only will this marry the flavors of your keto chicken soup, but it will help thicken it. Since we don’t want those carbs in our keto chicken soup, we’ll reduce it the old fashion way, which essentially allows the liquids to evaporate — similar to making keto soup slow cooker. The key to doing this is to cautiously heat our keto chicken soup. 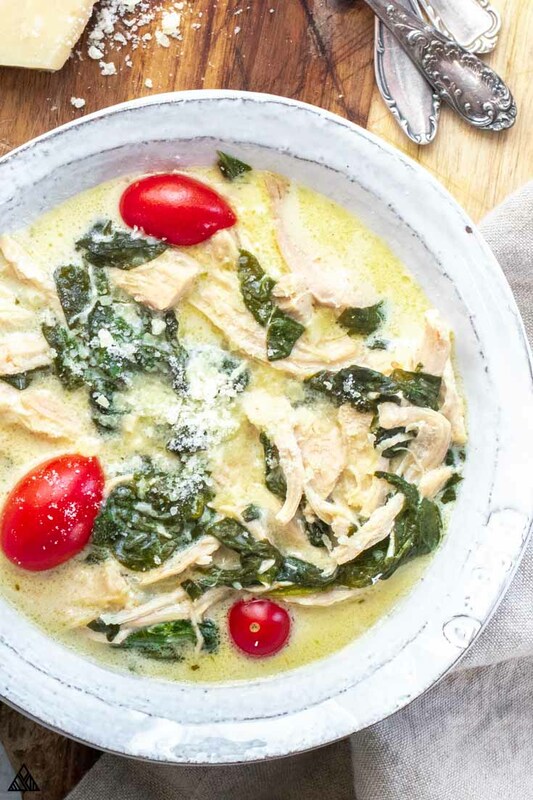 Since it contains dairy products (cream cheese and heavy cream), bringing it to a boil will curdle the milk — as will heating the keto chicken soup too quickly. Bring it to a slow and steady simmer and you’ll be good to go! Simmer your keto chicken soup until it reaches your desired consistency/thickness. Adding veggies (in the next step) will increase the water content of your soup — keep this in mind as you reduce. 4. Add additional low carb veggies. 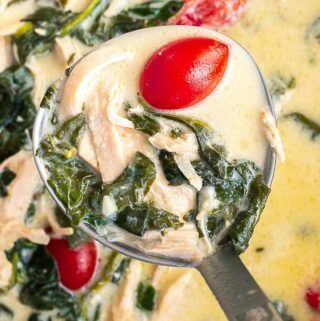 My favorite veggies for this keto chicken soup are spinach and tomatoes. I love sun dried tomatoes — if your carb goals allow for these, add them in! If not, cherry tomatoes are delicious and add a flavorful “pop”. As a frame of reference, sun dried tomatoes have almost double the carbs of cherry — YIKES, I know. 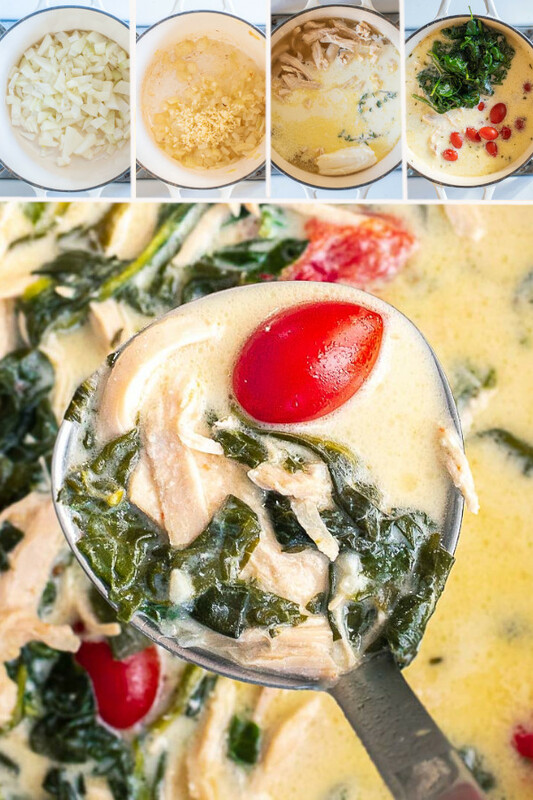 Here are a few keto chicken soup variations you may consider to appeal to you and your family’s taste buds! Traditional low carb chicken soup — this recipe is most similar to traditional chicken soup, only without the carbs. Instead of noodles, I sliced up long pieces of cabbage for a soup that’s every bit a satiating! Keto chicken vegetable soup — Add in your favorite veggies! Remember each vegetable require more/less time to cook. For aromatics and veggies that take longer to cook (think keto chicken broccoli soup) add them in with the onions. Veggies that cook quickly should be added with the spinach (keto chicken zoodle soup for example). Mushroooooooms — I love mushrooms, especially in a creamy keto chicken soup like this one. Try skipping the tomatoes and adding mushrooms with the onions. Low carb taco soup — alright, we know rice, beans and corn are out. But flavor doesn’t have to be! Use this keto chicken soup as a base, try adding salsa instead of tomatoes, and sour cream in place of cream cheese! Sprinkle some low carb taco seasoning and you’ll be good to go! Simple low carb salads — toss it in a simple low carb salad dressing such as keto caesar dressing. It’s always nice to dip something in your soup — try low carb crackers, keto crackers, or almond flour bread. Fresh parsley, thyme or more cheese — why not take advantage of these flavor packed low carb foods? You guys, keto soup is the BEST for low carb meal prep! I’ll often make a double batch, and freeze ½ for lazy low carb dinners to come, or for our low carb lunches that week. 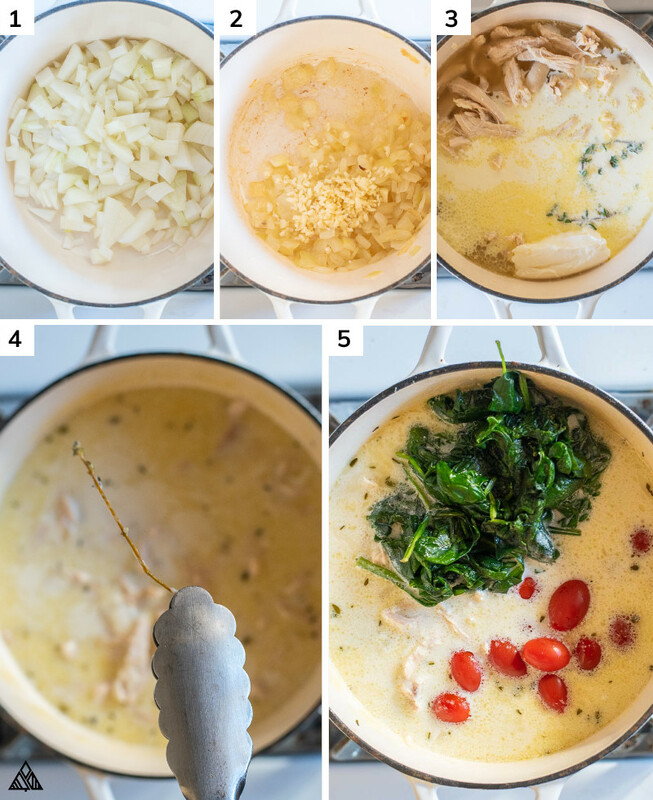 Use a ladle to divvy your soup into individual containers — be sure to use leak proof containers, the last thing anyone wants is a keto chicken soup covered car seat! Check out these best meal prep containers for some tips. There you have it crew! A keto chicken soup recipe that’s impossible not to love! Let me know what you think in the comments below — hope you and your family enjoy this as much as we do! Looking for the creamiest, most delicious and easy low carb recipes? Then look no further than this keto chicken soup! Crowd pleasing, easy weeknight meal that's perfect for meal prep! Heat vegetable oil in a pot over medium heat in a large dutch oven. Once shimmering, add chopped onion and 1 teaspoon of salt. Cook until translucent, about 10-12 minutes. Add minced garlic and cook until fragrant, about 2 minutes. Add chicken stock, heavy cream, cream cheese, chicken and thyme to the dutch oven and bring heat to a slow simmer. Cook uncovered at a slow simmer for 30 minutes, stirring occasionally — this will help to thicken the soup. If you’d like your soup to be thicker than it is after 30 minutes, continue to cook at a slow simmer until it has reached your desired consistency. Use tongs to remove the thyme stems. Add tomatoes, spinach and pepper and give everything a stir. Cook until you tomatoes and spinach have soften to your liking, for me it was about 8 minutes. Divide into bowls, cover with chopped parsley and enjoy! Skip the tomatoes and onions, or add less. The nutritional information is based on 1 cup of soup, if you cook the soup until there are about 8 cups of soup. That said, the nutritional information will vary depending on how much you reduce the liquid in this soup, so the easiest way to calculate your nutritional information is to divide the amount you made by 8, which will equal 1 serving. * You can purchase cooked chicken, or you can boil the chicken prior to making this dish. To do this, simple place 2 Lbs of chicken in a large pot and cover it with water (this will vary based on you pot size, use at least 4 cups). Sprinkle with salt and bring to a boil. Once boiling, cover and reduce heat to medium until chicken is cooked through — about 20 minutes. Cut into your largest piece to be sure there is no longer any pink. ** I prefer sun dried tomatoes in this recipe, however they’re higher in carbs than cherry tomatoes. If you can squeeze in the extra carbs, try sun dried tomatoes — be sure to read label to check that no sugar has been added. Also, drain the oil before adding them. In case You’re Wondering, Store Bought Low Carb Soups? It’s hard to find keto soup canned at the grocery store (let alone any keto chicken recipes! ), which is why I’m such a fan of making low carb soups in bulk and freezing the leftovers (basically the same as canned, right?). I find leftovers are one of the best ways to stick to a low carb meal plan! What do you think? Hi Sharon! The soup thickens as you cook it, so simmer it a little longer until it reaches your desired consistency 🙂 Also be sure you’re cooking it at a “simmer”, if it’s lower than that it will take a LONG time to thicken!